Watch footage of Miguel Almiron ‘horror tackle’ as NUFC star sees red & sparks mass brawl – NUFC blog – Newcastle United blog – NUFC Fixtures, News and Forum. 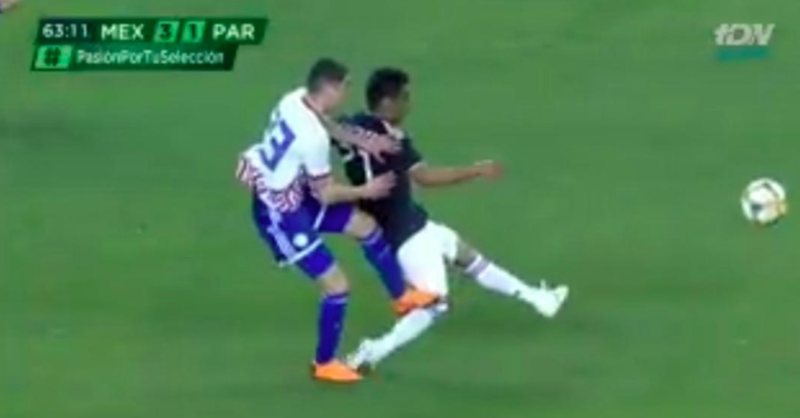 He’s looked like he wouldn’t harm a fly during his first few months on Tyneside, but Miguel Almiron has shown a rarely seen nasty streak on international duty with Paraguay last night. The 25-year-old had been on the field just 7 minutes during his country’s 4-2 defeat to Mexico, only to lunge in and rake his studs down the back of Gallito Vázquez’s knee. Almiron – who came on when his side were 3-0 down – had actually played a part in a Paraguay goal just minutes after his introduction, but he was soon dismissed; and rightly so. This is the first straight red of his career, with him only receiving 10 yellow cards and one red (via two bookings) in his 118 games prior to this.